Greens are not part of my culinary heritage. Mother didn’t cook greens – kale, chard, and collards were alien to her northern European Jewish background. She occasionally cooked spinach – not fresh but canned or frozen and cooked until vaguely slimy. I have fond memories of mixing slimy spinach with mashed potatoes to make it more palatable. But I recently bought fresh beets, which were attached to, of all things, beet greens. 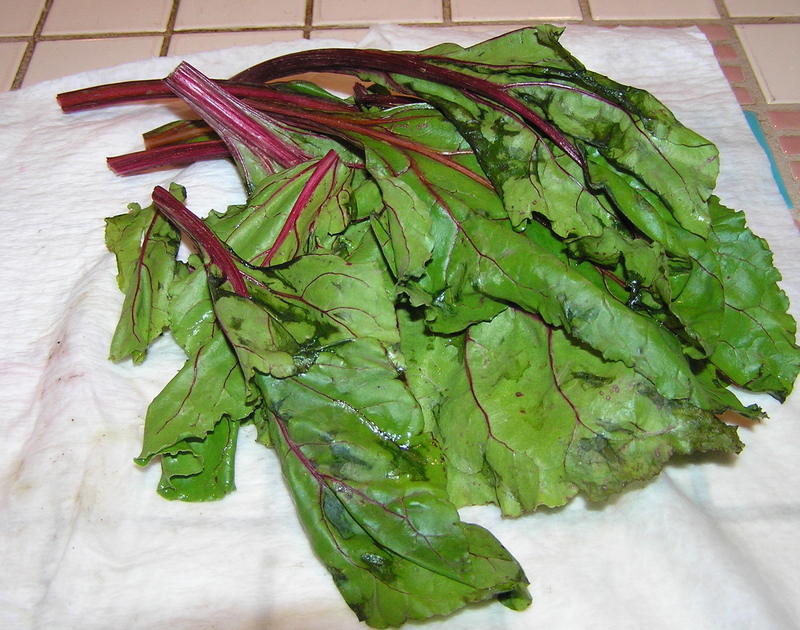 Now I have heard that beet greens are a delicacy, although I have never prepared them. Most of the recipes I found seemed to be for salad-y dishes. But it’s getting a trifle cold for salad, and I wanted to use the greens for something heartier. This recipe, from Cooking Light, matched ingredients that I already had in the house (often a significant motivator for cooking a particular dish). 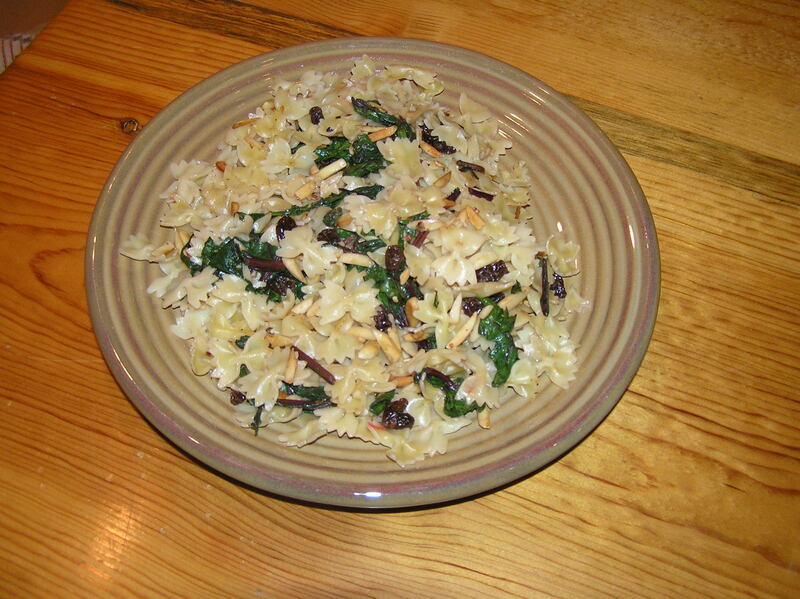 I confess that the combination seemed a little odd: greens, raisins, pasta and nuts? But it was surprisingly delicious, And also relatively quick to make. While pasta cooks and raisins soak, heat oil in a large nonstick skillet over medium-high heat. Add greens and garlic (I also added the almonds here so I didn’t toast them separately); sauté 3 minutes or until greens are tender. Stir in pasta, drained raisins, almonds (unless you have added them before), salt, and 1/8 teaspoon black pepper; toss with cooked pasta to combine. Sprinkle with cracked black pepper, if desired. Makes 4 servings at about 9 grams of fat/serving. My darling daughter gave me a basket of organic gourmet mushrooms for Mothers’ Day. What a great gift! Much better than flowers or chocolate. There are two pounds of exotic mushrooms. The first thing I did was pull off a handful of them and put them under a chicken breast I was baking for dinner. Then I started to research recipes. The mushrooms on the left are Brown Clamshell. Those are the mushrooms I put under the chicken breast. Directly to their right are Velvet Pioppini, which has an intense forest flavor. Above them are Forest Namekos, which are really odd. They have a naturally shiny glaze and are gold colored. The big mushrooms are Trumpet Royales, and above them are Alba Clamshells. Except for the Royales, they all come in clumps. You eat the stems as well as the caps on these mushrooms. I used the Brown Clamshells, a few of the Pioppini, and a couple of Royales in this recipe. If you don’t happen to have a basket of gourmet mushrooms, you can buy exotic mushroom blends at some groceries, or try a mix of shitake mushroom caps and cremini mushrooms. The original recipe, from Cooking Light, called for using whipping cream instead of the fat free half and half. This would make a richer recipe, at 11.5 grams of fat/serving. I wanted something lower in fat so that I could take leftovers for lunch. I found this preparation to still be very rich and flavorful – I think the whipping cream would make it overwhelming. Cook pasta according to package directions, omitting salt and fat; drain and set aside. Melt the butter in a large nonstick skillet over medium-high heat. Add the mushrooms, onion, shallots, garlic, ½ teaspoon salt, and pepper; cook 12 minutes or until liquid evaporates and mushrooms are tender, stirring occasionally. Add wine; cook 2 minutes or until liquid evaporates, stirring occasionally. Remove from heat. Add the cooked pasta, fat free half and half, cheese, and parsley, tossing gently to coat. Stir in remaining ¼ teaspoon salt.. Serve immediately. Makes 4 servings at about 5.3 grams of fat/serving. Another potluck. This time they said bring a salad or side dish that is “dairy” – contains no meat. To complicate things, I had to run errands before the gathering, and was going to a jazz concert after, so It couldn’t be a hot dish, and leftovers would have to be able to survive in the car for a couple of hours. Since it is very cold, I wasn’t really worried about spoilage. And of course, it had to meet my standard potluck principle of being something I could eat at the potluck to avoid the fatty dishes others brought, and the leftovers would be ok to eat without being too high fat. I decided on a pasta salad with a Thai flavor so it would be a little different, but easy to transport. This was also good as a leftover for lunch, when I added little cooked shrimp to it one day, and tuna the next. Cook pasta according to package directions. Rinse under cold water and allow to drain completely. Toss pasta with remaining salad ingredients (tomatoes through cilantro). To make dressing, whisk together all ingredients in a small bowl. Pour over pasta and toss thoroughly. 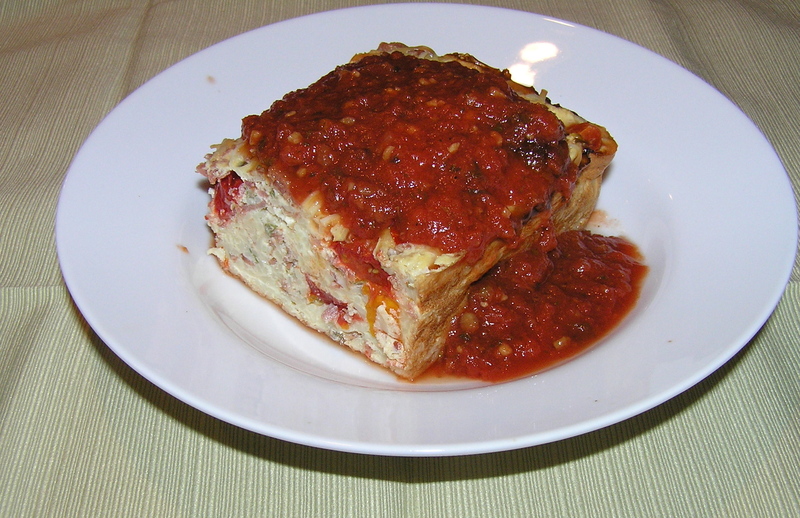 Makes 8 1½ cup servings at about 2 grams of fat/serving. NOTE: You can use any kind of small pasta you’d like – orzo, little shells, small macaroni, etc. I was originally planning to use small shells until I found adorable mini farfalle (bow ties), which I thought gave the salad an interesting look. VARIATION: I made this salad milder and sweeter than I might have if I wasn’t taking it to a potluck. If you want to give it a real Thai kick, reduce the sugar to 2 teaspoons, and increase the chili paste to 1 teaspoon – or more to taste. I have been growing basil and cilantro in pots on a high deck where the deer can’t reach them. 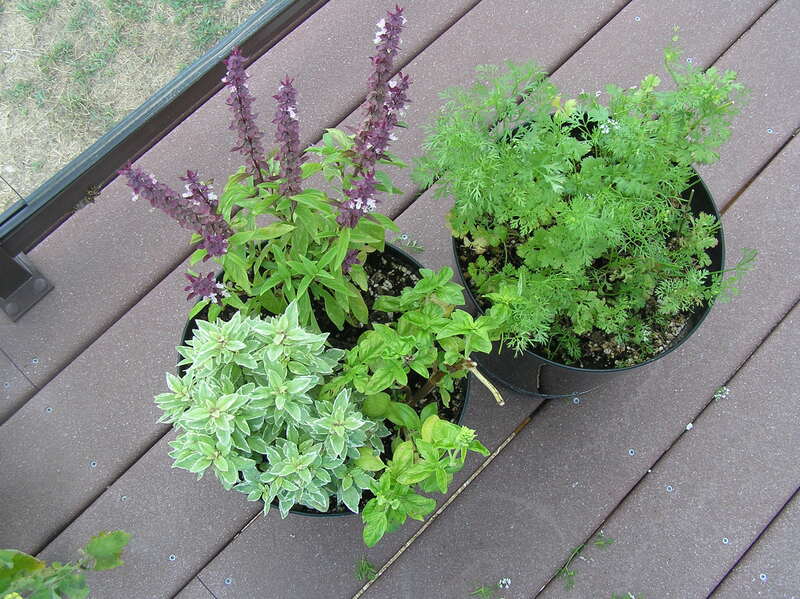 Normally, they treat my gardening efforts as a salad bar, but without their predations my herbs have grown heartily. The Thai Basil was so beautiful that I’m not eating it, just growing it ornamentally. Of course, now I’m drowning in basil – until I came across this recipe from Coconut and Lime. She created it to use up leftover spaghetti and an abundance of cherry tomatoes. I didn’t have leftover spaghetti, but I did have three opened bags of No-Yolks fine noodles with small amounts of noodles that could be combined (I really should check the pasta shelf before I open new bags). I also had overbought grape tomatoes, so I needed to use them before they turned into mush. 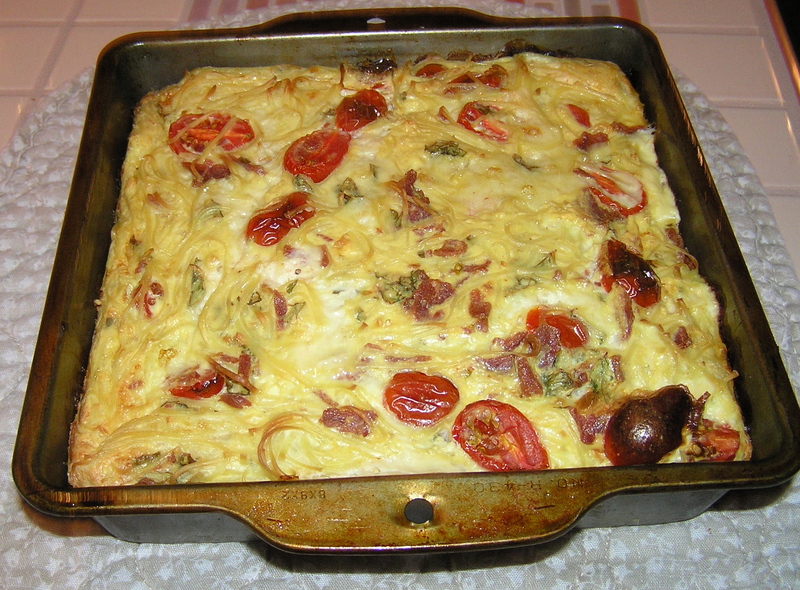 Variation: You could easily leave out the bacon, and it would make a nice vegetarian dish. This would reduce the fat gram count by about 1 gram/serving. I’m also going to try this with low-fat Swiss cheese one day soon. The basil is still growing vigorously. 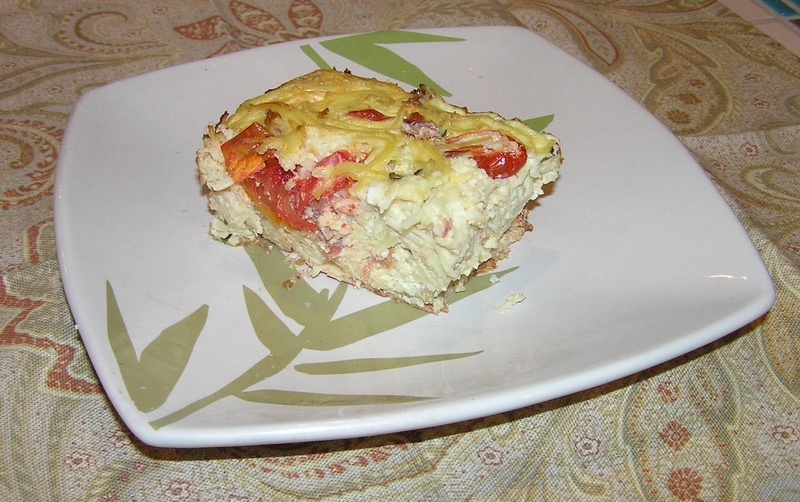 The original recipe described this as a breakfast dish, but to me it was more lunch or dinner-like. I took the smaller serving for lunch, heating it in the office microwave for about a minute. But it really shined as a dinner dish with spaghetti sauce over it. This was a peppery sauce with virtually no fat in it, but I think any red sauce would taste great, as long as you accounted for the fat grams in the sauce in your serving.. Hint: I freeze leftover spaghetti sauce in 1 cup containers so I have small amounts when I need them.